4دانشجوی کارشناسی ارشد گروه ترویج و آموزش کشاورزی، دانشگاه تربیت مدرس. تهران، ایران. هدف این پژوهش، بررسی عامل‌های مؤثر بر پذیرش کشاورزی ارگانیک است. این تحقیق کاربردی و از نوع توصیفی– همبستگی است. جامعة آماری مدنظر را تولید‌کنندگان محصولات کشاورزی استان البرز تشکیل می‌دهند که حجم نمونه‌ با استفاده فرمول کوکران و روش نمونه‌گیری تصادفی طبقه‌ای تعیین شد و 200 تولیدکننده انتخاب شد. ابزار اصلی جمع‌آوری اطلاعات، پرسش‌نامة محقق‌ساخته است که روایی آن را تعدادی از استادان دانشگاه و کارشناسان جهاد کشاورزی استان البرز بررسی و تأیید کردند. پایایی پرسش‌نامه نیز از طریق انجام پیش‌آزمون و محاسبة آلفای کرونباخ برای هر یک از بخش‌های آن برآورد شد (72/0تا 95/0) که بیانگر مناسب بودن ابزار تحقیق بوده است. یافته‌های تحقیق نشان داد که مانع‌های پذیرش کشاورزی ارگانیک و عامل‌های مؤثر بر توسعة آن در بین کشاورزان با سطح تحصیلی متفاوت (فوق دیپلم و کمتر و لیسانس و بیشتر) اختلاف معنی‌داری در سطح یک درصد دارد. همچنین بین سه متغییر نگرش به کشاورزی ارگانیک، میزان استفاده از کانال‌های دریافت اطلاعات فنی و میزان به‌کارگیری عملیات کشاورزی ارگانیک با پذیرش آن در بین کشاورزان استان البرز همبستگی مثبت و معنی‌داری مشاهده شد. 1M.Sc of Agricultural Management, Abhar Azad University, Zanjan, Iran. 2Assistant Professor of Agricultural Extension and Education, Tarbiat Modares University, Tehran, Iran. 3Assistant Professor of Agricultural management, Abhar Azad University, Zanjan, Iran. 4M.Sc. Student of Agricultural Extension and Education, Tarbiat Modares University, Tehran. The aim of this study is to investigate the factors affecting adoption of organic farming. The study is a kind of applied and descriptive–correlational method. The research population is agricultural producers of Alborz Province. Sample size was determine by Cochran's formula (n= 200) and using proportional stratified random sampling method. Data was collected through questionnaires that developed by researcher. Validity of questionnaires is estimated by a panel of experts in University and Agriculture experts of Jihad-e- Keshavarzi department of Karaj city. Reliability was conducted by a Pilot test study and for each of its parts Cronbach’s alpha coefficient estimated (0.72 -0.95) which show its suit for research conduct. Data analysis using SPSS software package show that there is a significant difference between barriers to adoption of organic farming in under graduate and post graduated level at the 0.01 level. 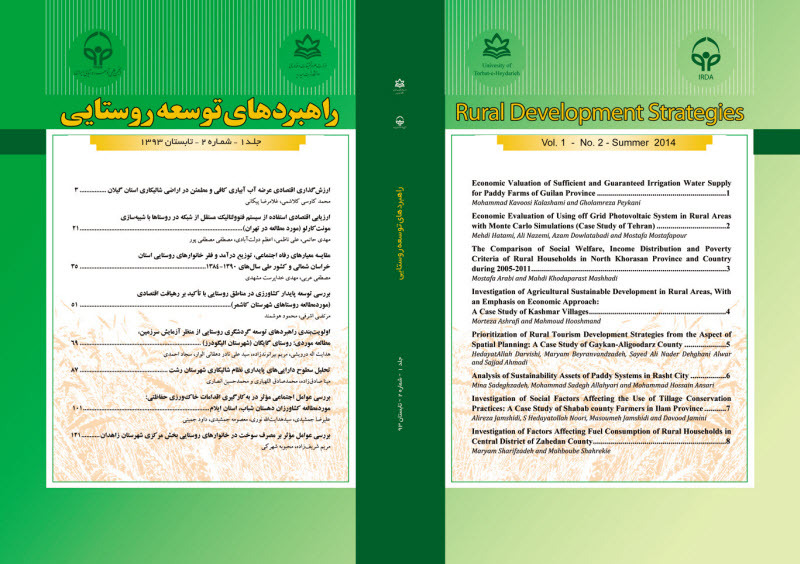 Also there is a positive relation between attitudes, technical information and frequency of connective channels with adoption of organic farming among Alborz Province farmers. اسدی ع.، و نادری مهدیی ک، (1388)، کشاورزی پایدار، تهران: انتشارات پیام نور. اﻣﻴﻨﻲﺭﻧﺠﺒﺮ غ، (1384) «ﻛﺸﺎﻭﺭﺯﻱ ﭘﺎﻳﺪﺍﺭ»، ﻧﺸﺮﻳﻪ ﻋﻠﻤﻲ ﺗﺨﺼﺼﻲ ﺩﻓﺘﺮ ﻣﺤﻴﻂﺯﻳﺴﺖ ﻭ ﺗﻮﺳﻌة ﭘﺎﻳﺪﺍﺭ ﻛﺸﺎﻭﺭﺯﻱ، ﻭﺯﺍﺭﺕ ﺟﻬﺎﺩﻛﺸﺎﻭﺭﺯﻱ. حبیب‌پور ک. و صفری ر، (1391)، راهنمای کاربرد spssدر تحقیقات پیمایشی، تهران: انتشارات لویه. سواری م.، شیری ن. و شعبانعلی فمی ح، (1391)، «کشاورزی ارگانیک (زیستی) راهبردی در جهت محیط‌زیست پایدار روستایی»، دومین کنفرانس برنامه‌ریزی و مدیریت محیط زیست. 26 و 27 اردیبهشت. تهران. 11-1. شریفی‌مقدم م (1392) «تحلیل اقتصادی- اجتماعی کشاورزی ارگانیک با بررسی موجود»، قابل دسترس در: www.organic.javanblog.com (آخرین دسترسی: 25 آذر 1393). http://www.berenge.com/Articles/ShowArticle.aspx?ArticleID=2999 (آخرین دسترسی: 25 آذر 1393). صالحی س.، رضایی مقدم ک. و آجیلی ع، (1387)، «کاربرد تکنولوژی‌های نظارت عملکرد :الگویی برای کشاورزی پایدار»، مجله علوم ترویج و آموزش کشاورزی، 4(1): 32-15. عسگری ح. و حسنی مقدم م، (1389)، سند برنامه‌ای راهبردی توسعة تحقیقات گیاه‌پزشکی کشور، تهران: انتشارات مؤسسة تحقیقات گیاه‌پزشکی کشور. مارکوس ا، (1390)، «خبرنامة داخلی انجمن ارگانیک ایران» 3(3): 10- 1. قابل دسترس در http://organic-farming.persianblog.ir/1390/10 (آخرین دسترسی: 15 آذر 1393). محمدی ف، (1389)، «طراحی الگوی کشاورزی پایدار کم نهاده در تولید محصولات گلخانه‌ای استان تهران»، رسالة دکتری ترویج و آموزش کشاورزی، تهران: دانشگاه آزاد اسلامی، واحد علوم وتحقیقات. محمودی ح.، مهدوی دامغانی ع. و لیاقتی ه، (1387)، درآمدی بر کشاورزی ارگانیک (زیستی)، مشهد: جهاد دانشگاهی مشهد. مرادی پ. و نجف‌آبادی ا، (1390)، «موانع به‌کارگیری استاندارد عملیات مناسب کشاورزی جهانی (گپ جهانی) در بخش کشاورزی ایران»، مجلة پژوهش‌های ترویج و آموزش کشاورزی،4(1): 39-27. مقصودی ط. وداودی ه (1388)، «بررسی میزان پایداری کشت سیب زمینی و تحلیل عوامل مؤثر برآن»، مجلة ترویج و اقتصاد کشاورزی، (2)1: 101-89 . ملک‌سعیدی ح.، آجیلی ع. و رضایی مقدم ک، (1388)، «عوامل مؤثر بر دانش کارشناسان کشاورزی سازمان جهاد کشاورزی استان خوزستان نسبت به کشاورزی ارگانیک»، مجلة تحقیقات اقتصاد در توسعة کشاورزی ایران، 40 (2): 91-81. مهدوی دامغانی ع.، کوچکی و.، قربانی ه.، لیاقتی س. و فرزانه م، (1387)، کشاورزی زیستی (ارگانیک) استانداردها، اصول تأیید صلاحیت، گواهی و بازرسی، تهران: انتشارات دانشگاه شهید بهشتی. تهران. نصراصفهانی ا. و میرفندرسکی س، (1385)، «کشاورزی ارگانیک گسترش می‌یابد» ماهنامه سرزمین سبز،42: 14-12. نوروزی ع. و شهبازی ا، (1389)، «نقش ترویج در توسعة کشاورزی اُرگانیک (زیستی) در روستاهای کشور»، توسعة روستایی، 2(2): 22-1. De Buck A. J., Rijn I. V., Röling N. G. and Wossink G. A. A. (2001). Farmers' reasons for changing or not changing to more sustainable practices: an exploratory study of arable farmers in the Netherlands. The Agricultural Extension and Education. 7: 153-166. Hewlett E. and Melchett P. (2008). Can organic agriculture feed the world? A review of the research. In IFOAM organic world congress. June 16-20. Modena, Italy. Gundogmus E. (2006). A comparative analysis of organic and conventional direct apricot production on small households in Turkey. Asian Plant Sciences. 5: 98-104. Khaledi M., Gray R., Weseen S. and Sawyer E. (2007). Assessing the barriers to conversion to organic farming: an institutional analysis. Department of Agricultural Economics University of Saskatchewan. Final report. 67p. Leifeld J. ( 2012.) How sustainable is organic farming?. Agriculture, Ecosystems and Environment. 150: 121-122. Midmore P., Padel S., McCalman H., Lampkin N. H., Fowler S. and Isherwood J. (2001). attitude to organic production: a survey of producers. Unpublished final report to MAFF, Institute of Rural Studies, University of Wales, Aberystwyth. Mishra B. B. and Nayak K. C. (2004). Organic farming for sustainable agriculture. Orissa Review. 42-45. Salazar R. C. (2005). Social and institutional opportunities and constraints of organic agriculture in the Philipines. Conference on International Agricultural Research for Development. October 11-13. Stuttgart-Hohenheim. Sanderson K. (2004). Extension support for organic farmers in the south: A functionof attitude, knowledge, or confidence?. Theseis of Master. University of Florida. Sterrett S., Groover G. E., Taylor D. B. and Mundy K. (2005). Describing organic agricultural production in virginia results of the 2004 farm survey. virginia’s rural economic analysis program. Department of Agricultural and Applied Economics, College of Agriculture and Life Sciences, Virginia Tech. 29p. Stobbelaar D. J., Casimir G., Borghuis J., Marks I., Meije L. and Zebeda S. (2006). Adolescents attiudes toward organic food :A survey of 15-to16 years old school children. Internatinal Consumer Studies. 21: 45-60. United Ststes Department of Agicultur. (2013). What is Organic?. Available at: http://www.NOSB.al.htm. Willer H. and Kilcher L. (2012). The world of organic agriculture - statistics and emerging trends 2012. Research Institute of Organic Agriculture (FiBL), Frick, and International Federation of Organic Agriculture Movements (IFOAM), Bonn. Wynen E. (2004). Conversion to organic agriculture: problems and possibilities in the cereal livestock industry. available at http://www.elspl.com.au/abstracts/conversion.htm (Last access: 1 january 2012).